When Sally Jo Davis Sang The Folk Blues. Sally Jo and one of her animal friends. I was blessed to be married to a great folksinger/guitarist, who was also a world-class elementary school teacher. The late, great Sally Jo Davis, born in 1952, grew up in the beautiful Pacific Northwest, near Seattle, Washington. As a tween/teen, she was a proud member of the Girl Scouts. During her time with the Scouts, she not only came to be an expert hiker and backpacker, she also learned how to play and sing a large number of traditional folk songs. And, she got very good at it. — Not super-polished, because that would not be appropriate; but very good at performing true folk music. 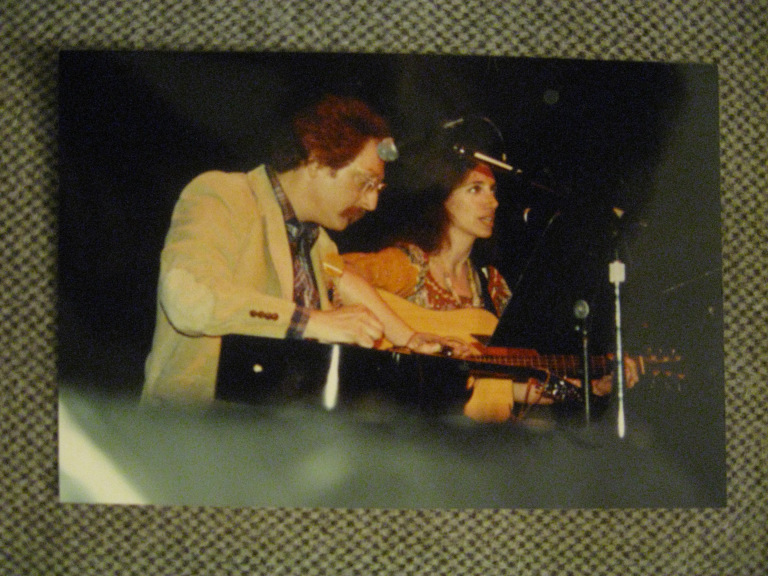 I was lucky enough to meet her in 1985 at a jam session I was hosting; we soon started a folk group, and eventually…. we fell in love and were married. 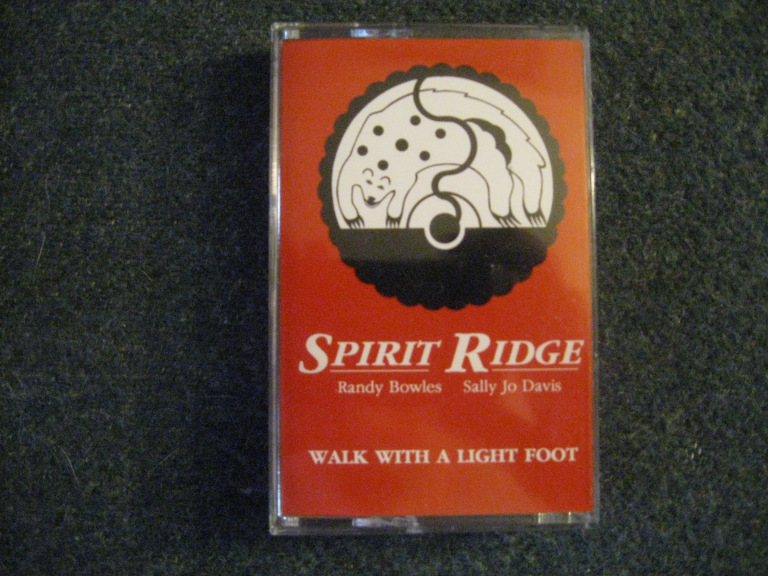 Sally Jo and I performed approximately 500 concerts as the folk duo/trio Spirit Ridge. Every one of those gigs was smoke-free and all-ages. We recorded and released two award-nominated albums, “So Ready To Go”, and “Walk With A Light Foot”. Believe it or not, quite a few of the songs in our repertoire were songs that Sally Jo learned in the Girl Scouts. — However, we were always in need of more songs. One of my jobs as the leader of Spirit Ridge was to listen to scores of traditional folk songs, in search of new material. I developed a practice of taping numerous folk music shows that our area public radio station, KBCS, aired. When time allowed, I’d go back and listen to the tapes, hoping to discover songs we could learn. I can’t recall who the singer was, but one day, while reviewing a tape, I came upon a folk blues version of the traditional “Boll Weevil”, the ubiquitous song about the little insect that, years ago, wreaked havok on cotton crops all over the American South. I immediately heard, in my head, Sally Jo singing the song. I got out my trusty Guild acoustic guitar, and carefully worked out my own folk blues version of the song; and then, I taught it to Sally Jo. She loved it; I loved the way she sang it. She nailed it! At the very end of the song, she hit some low, bluesy notes that sent chills through my body. — I had just known the song and Sally Jo were made for each other; she proved me right as rain. — In our arrangement of the song, I wound up playing my Guild on my lap, with a “steel” — a metal bar that allowed me to play “dobro-style”; while SJ finger-picked her vintage Gibson parlor guitar. SJ and me; I’m playing dobro-style. We’re actually playing “Boll Weevil”, on the KBCS Radio Folklife Festival stage. Eventually, we recorded our “Boll Weevil” at Richard Ruskin’s Lion Dog studio in Seattle, and included it on the “Walk With A Light Foot” album. I’m proud to say that the album was nominated for a Folk Music Album of the Year award at the 1991 Northwest Area Music Awards. I sent copies of the album to various radio stations and magazines, in hopes of receiving air play, and reviews. We received a very favorable review from a trad folk magazine with the unusual name of Dirty Linen. The magazine’s reviewer quite-rightly paid tribute to Sally Jo’s “rich, earthy vocals”. For the next few years, we continued to gig, receive radio airplay, and have great fun with our music. However, in 1995, after doing those 500 shows, we felt that we had said what we wanted to say, musically-speaking. We decided to move on to other interests. We enjoyed collecting things like African and Mexican art, and folk dolls; and we decided to invest our time and energy in that. And, we amassed an amazing collection, which I’ve blogged about here. Well, folks: my beloved Sally Jo passed away from a very hard battle with ALS in January of 2015. I wanted to ensure that she is represented on YouTube with her very own video. — Just about everyone knows how to go to YouTube and watch a video; it reaches billions of people. 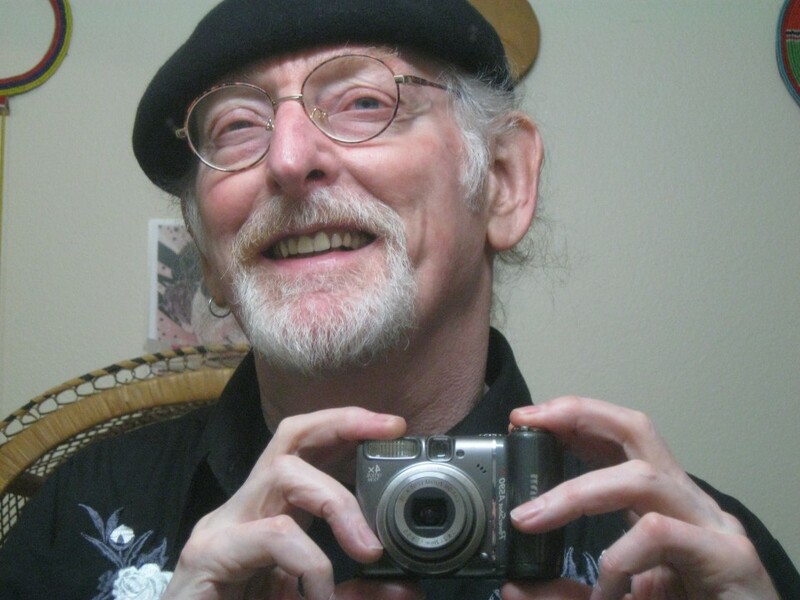 So recently, I asked my young Hungarian friend, Peter Garami, if he would make a video of “Boll Weevil”, and upload it to YouTube for me, in honor of Sally Jo. — He did. It’s more of an “audio” than a video. 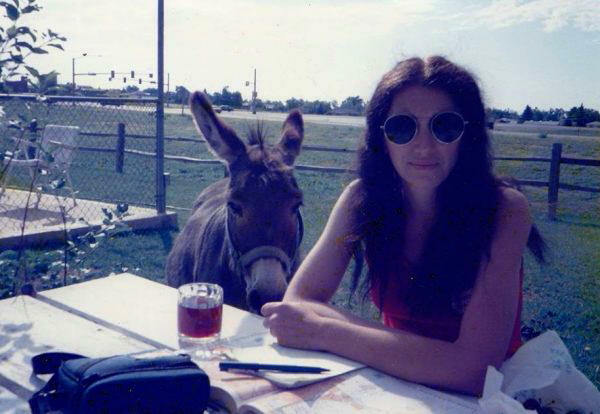 It simply features the photo shown above, of SJ and a friendly burro; which I took on one of our fabulous “Old West” trips. Sally Jo loved to drive, and she drove us all over the beautiful western states, nearly every summer. Yes, we had some epic trips, which I’ve also blogged about. So, here is Sally Jo Davis, singing the folk blues, accompanied by her authentic finger-picking, and my dobro playing. Just click below, to listen. 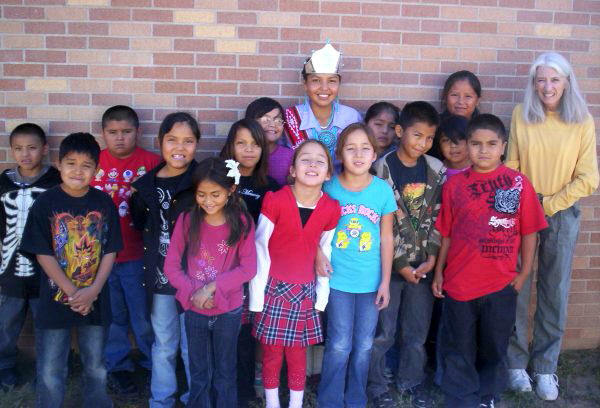 Sally Jo, with her class on the Navajo Reservation, New Mexico. Oops! I almost forgot to include a salient detail in my story: Sally Jo and I were divorced in 2000! But it was not for the “usual” reasons. I won’t go into detail. — Sally Jo moved to New Mexico, bought a cabin and an early version of a hybrid vehicle, and went to work as a teacher at a Navajo tribal school. She was a very skilled, dedicated teacher. — I’ve previously published stories about some of her amazing classroom adventures. — We remained friends, via email, right up until the time she could no longer speak, or use her iPad, due to the complete takeover of her body by ALS. I will always love her. I haven’t seen SJ since 2003; and I realize I will never see her again. But I can go back and relive one of the best periods of my life, by listening to her sing and play, on the studio recordings we made, and on the live tapes we made at our gigs. — Or on YouTube! — Rest in peace, Sally Jo. You needed to go on your own walk; but while we walked the path together, it was grand. Just grand. And…. I know that “late, great” is a cliched way of describing someone who has passed; but there are some folks for whom it truly should be applied.